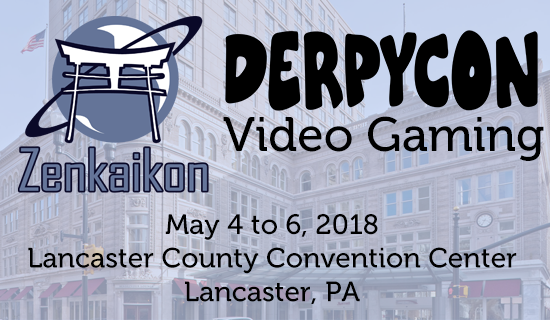 DerpyCon is excited to announce that our video game team will be coordinating the video game room and tournaments at Zenkaikon, May 4-6, 2018! Come find us in room Heritage DE of the Lancaster County Convention Center. Can’t make it to con? Follow our stream on Twitch at twitch.tv/derpycon! On Saturday, May 5 from 12:00pm to 3:00pm, representatives from Nintendo will be visiting the game room and doing demos! DerpyCon will be holding tournaments throughout the weekend. You can sign up to participate at the game check out table in the room on site.